Chalicea makes her second appearance in the Listener Series, after her debut Listener No 4244 last year themed around Emily Davison, who somehow or other ended up underneath the King’s horse. 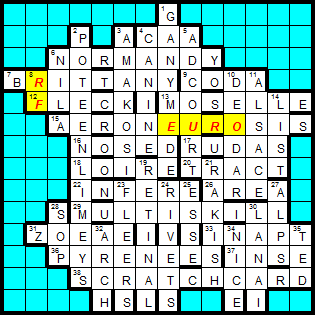 A relatively easy puzzle jam-packed with thematic material, and I guest-blogged that one. Could we expect the same this time? Well, probably, as that’s pretty much Chalicea’s signature puzzle: relatively easy clues with an artistic grid as a result. On we go then! Only… this didn’t look quite so easy at all! “… roughly a third of the cells of the presented grid are not utilised,” said the preamble, and the already ominous blank grid became a step harder before we’d even started. On the other hand, it seemed likely that the shape of the grid would be somehow thematic, so that might be some help. Or not. Still, as always with cartes blanches you need to solve a fair few clues to get going, and at least I could rely on those being fairly easy. By and large this was actually true, although one or two caused more problems than perhaps they should have. 1dn was evidently GANYMEDE ((judgement + a y[ear] – ju[ry])*, extra T), and after a while I had enough material from the first few clue numbers to try and get working on that jigsaw. Those clue numbers had been puzzling me, too, but of course I was being told rather generously that the top half of the grid was going to be rather thinner than the 14 cells available. Once I discovered CANINE and AD COURT crossing with NORMANDY, I was away! 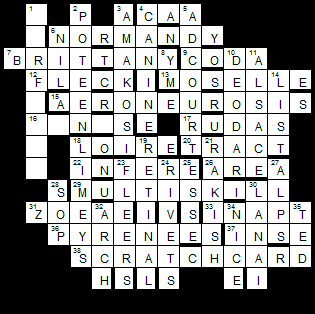 And this puzzle clearly was going to be French-themed. “Mais oui, monsieur,” you might say, “did not Chalicea’s last feature ‘cherchez la femme’? Does she not live in the neighbourhood?” She’s in that neck of the woods anyway. What more natural inspiration for a puzzle than the view from outside your window? As Friday evening came and went, I’d worked my way steadily through the top half, with just one problem: where did GANYMEDE fit? Perhaps I’d parsed that wrongly after all? And what’s going on near the left of the grid? Lots of unanswered questions. Time to sleep on it. And so, I would have to give the puzzle a third viewing, apparently… Off to have a go at the IQ instead. Thankfully, Phi’s offering didn’t take too long and so I was able to look again in the afternoon, and lo and behold, GANYMEDE was there after all, resolving all those nasty unching problems in the middle of the grid! Some tidying up later, and 8dn RF (République Française) appeared, that strange geography sorted itself out, and all of the rows of the grid were used after all. Phew! This entry was posted on 3 October 2014 at 4:01 pm	and is filed under Solving Blogs. Tagged: carte blanche, Chalicea, France. You can follow any responses to this entry through the RSS 2.0 feed. You can leave a response, or trackback from your own site. Jaguar – if you want to see a spectacular puzzle in the shape of Wyoming try Listener 4031 (still my favourite all time Listener) by Shackleton. We were lucky enough to win this one — following the advice to deal with blank cells however we saw fit, Katie added some GCSE Geography-style shading; hopefully the setter would approve. Top puzzle Chalicea, and thanks for the Brewer’s! Delighted, Paul and Katie – that’s just the ticket!